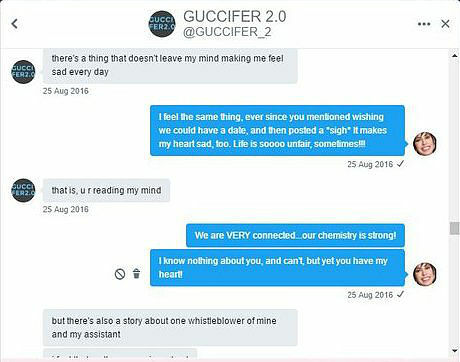 In August of 2016, the entity calling itself Guccifer 2.0 engaged in a series of Twitter DMs with Robbin Young. - Within the last month Robbin published the DMs on a site on the domain "robbinyoung.info" and a video was posted to YouTube featuring the DMs. Within the last 48 hours, I've received reports that the video and the site have been removed. 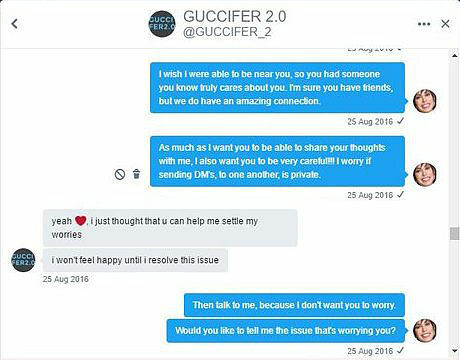 This is unfortunate, because some parts of the conversation were very interesting, especially where Guccifer 2.0 apparently contradicts his own hacking claims. 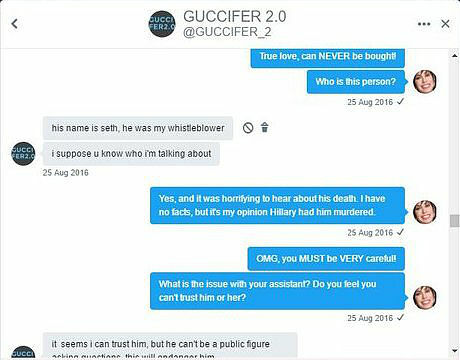 The most significant of their conversations was one that took place on 25 August 2016 and related to suspected whistle-blower Seth Rich. 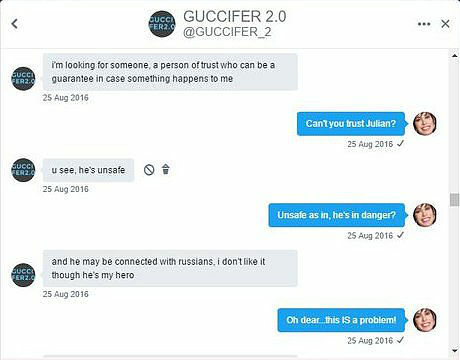 There is some potential for ambiguity but Guccifer 2.0 is either stating that Seth Rich is unsafe and may be connected with Russians - or he could be stating it about Julian Assange. - As G2 states "he's unsafe", it would seem most logical that he was referencing Assange as it's not the sort of thing you'd say in reference to someone that was deceased. 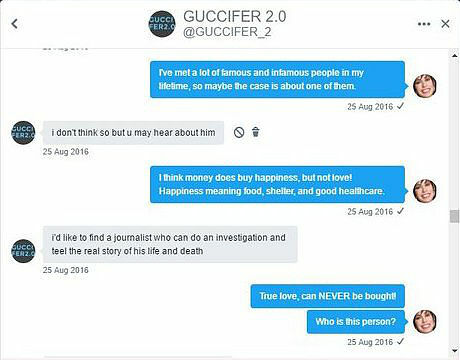 Guccifer 2.0 then claims he's looking for a journalist who can investgate and tell the real story of his (the whistle-blowers) "life and death". 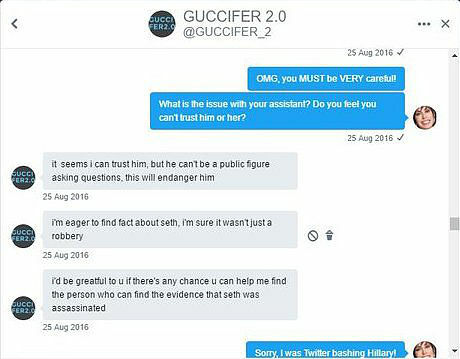 It is therefore interesting to see in this Twitter exchange that the Guccifer 2.0 operation was willing to contradict its own earlier claims to have been the entity who hacked the DNC for the sake of attributing itself to Seth Rich and making statements about Assange being unsafe due to alleged ties with Russians. 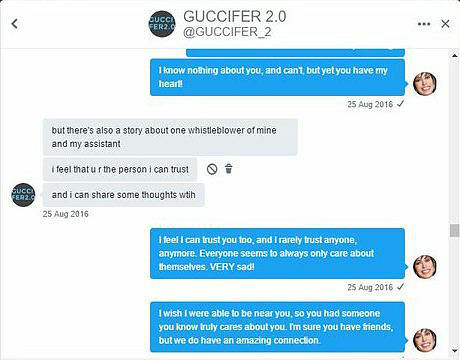 At this point in time, Guccifer 2.0 was under the impression it had successfully attributed itself to Russian hackers (through it's efforts on the 15th of June) - So, by attributing itself to Seth, it was preemptively discrediting Seth (tying him to the supposed "Russian hacker") before there was a chance for anyone to discover or disclose him as being a source of DNC emails (if Guccifer 2.0 was assuming that to be true). This would then mean Seth (and subsequently any leaks, if he was the leaker) could then be attributed to Russians. 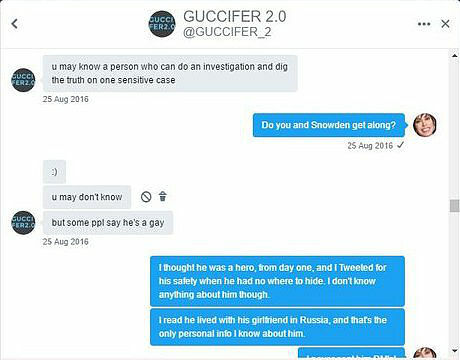 NOTE: This article is not arguing that Seth Rich was involved, it's just simply a consideration of Guccifer 2.0 believing that to be the case and apparently making claims on that basis.